Credit: NASA/Penn State/F.Bauer et al. 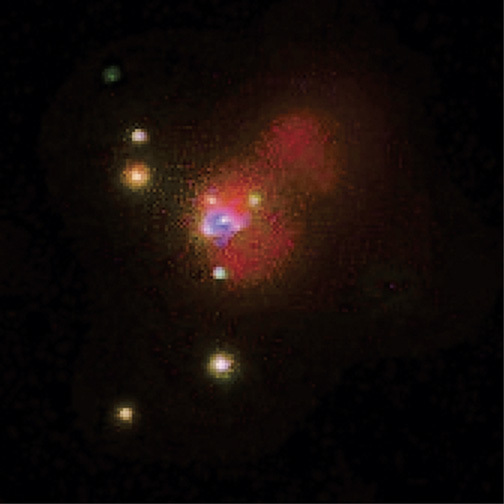 This Chandra X-ray image shows the inner portion of the Circinus Galaxy, with north at the top of the image and east to the left. In terms of X-ray energies, red represents low energy, green intermediate and blue the highest observed energies. The emission is resolved into a number of distinct components, many of which are associated with a central black hole. A bright, compact emission source is present at the center of the image. That nuclear source is surrounded by a diffuse X-ray halo that extends out several hundred light years. The X-rays directly to the northwest of the nucleus appear red, indicating predominantly soft energies, while the X-rays to the southeast are blue, indicating only hard energies. 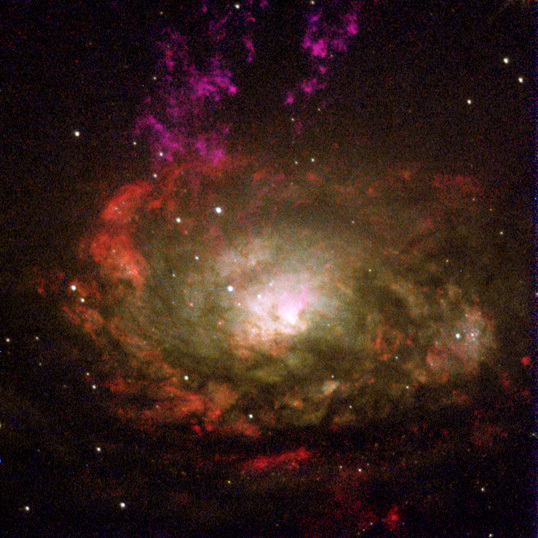 Because low X-ray energies are absorbed by gas more easily than higher energies, the sharp contrast suggests that the red emission to the northwest originates from the near side of the disk of the Circinus Galaxy. And, the blue emission is more highly absorbed and must come from the gas within the disk or on the far side. Such geometry corresponds to the disk of the galaxy as seen in optical and radio images. A bright, soft X-ray plume of emission extends approximately 1,200 light years (380 parsecs) to the northwest and coincides with an optical region containing gas ionized by the nucleus. There is a very strong correlation between the X-ray emission and the high-excitation ionized gas seen in emission-line images obtained by the Hubble Space Telescope and ground-based telescopes. The X-ray image was made with NASA's Chandra X-ray Observatory and the Advanced CCD Imaging Spectrometer (ACIS) from 67,000 seconds of exposure time on June 6-7, 2000. This and future X-ray images will enable scientists to examine regions of the Venusian atmosphere that are difficult to investigate otherwise. Credit NASA/Penn State/F.Bauer et al. Scale Image is 80 arcsec across. Coordinates (J2000) RA 14h 13m 10.20s | Dec -65° 20' 20.6"